Can you believe Thanksgiving is upon us??? We would like to thank you for following the Xtrema Blog by continuing to offer different products at a special discount price. To jump start the 2010 Holiday Season, we are going to run a weekly product promotion all the way through January 1, 2011. You will be able to SAVE 15% on a different product or set each week. 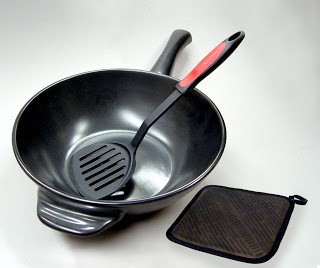 The feature product for the week of November 22 -November 30th is The Xtrema 3 Piece Wok Set. The Promo Code to enter will be (xweek15) which will allow you to save 15% on that specific product. 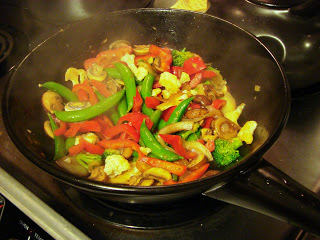 This promo will only be good for the week so don’t hesitate to purchase if The Xtrema Wok sparks your cooking interest!! What makes Xtrema different from metal cookware?? The healthiest non-scratch cookware, ever! Xtrema cookware is made of inorganic non reactive natural minerals that make the product environmentally friendly. This cookware clearly addresses today’s growing desire for a healthier cooking alternative to metal cookware and their coatings, which can eventually deteriorate and peel or flake off into foods. Xtrema also provides greater functionality in terms of usage with multiple cooking appliances. Xtrema can be used safely and effectively in the oven, microwave, toaster oven, broiler, stored in the freezer or refrigerator or used to serve food right on the table. More versatility means fewer pans to use and clean. Remember to use the Promo Code (xweek15) to save 15% on The Xtrema Wok! !